America Rising: The Republican PAC that's filming every vulnerable Democratic candidate. The Republican PAC that’s filming every single thing that key Democratic candidates do or say. 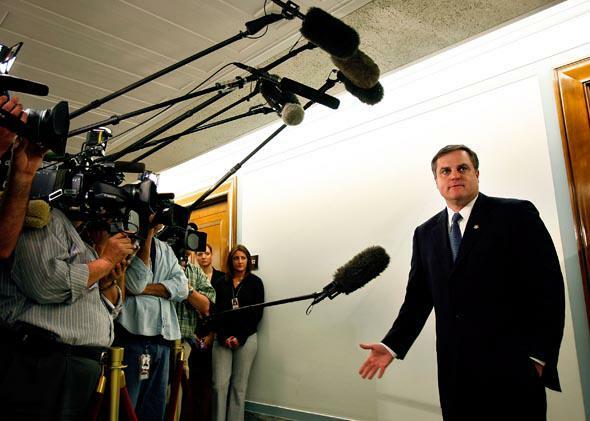 “If there’s a controversy regarding some local official in Arkansas, we can go back and we know what Mark Pryor (above) said about it,” said Joe Pounder of America Rising. “Go back and look at that Michelle Obama speech,” says Tim Miller. It’s Jan. 9, and the 32-year-old Republican strategist is perched in front of his Macbook Air, explaining how the first lady just hurt the Democrats’ candidate for an open Senate seat in West Virginia. It’s Miller’s job to obsess about those details. He runs America Rising PAC, the Republican-aligned opposition research factory launched 10 months ago by Mitt Romney’s defeated campaign manager Matt Rhoades. After the election, the Republican National Committee researched and released an autopsy of the loss. The party needed, according to the RNC, was a group that did “nothing but post inappropriate Democrat utterances and act as a clearinghouse for information on Democrats.” Miller left the RNC to join the clearinghouse; As of last week, between the PAC and the LLC run by fellow oppo vet Joe Pounder, America Rising employed 47 more people, full or part-time. America Rising found office space in the right-to-work concrete paradise of northern Virginia, one metro stop outside of Washington, D.C. Visitors walk into a minimalist space, with no receptionist, past a coffee table that stacks old magazines with conservative cover stars. Every few feet there’s a portrait of a Republican icon like Teddy Roosevelt or a ha-ha-remember-that joke at a Democrats’ expense. The centerpiece is a blown-up photo of John Kerry taking a bodysuited windsurfing break during the 2004 campaign. They bought it on eBay. That’s about it. The office is quiet, no TVs blaring cable news, most TVs relegated to a “war room” away from the researchers’ desks. Many of its employees spend their days “tracking” Democratic candidates, particular Senate candidates in key states. These trackers attempt to shoot video of every single public utterance the candidates’ make, in hopes of catching gaffes and flip-flops and collecting an archive that can be mined for hypocrisy and errors. “Big oppo” is the Republican response to the Democrats’ highly successful American Bridge project, whose 2012 work Pounder and Miller praise effusively. One reason why America Rising and American Bridge do so much tracking is that it is easier now—quick uploads where there used to be lengthy ftp wait times. “I did tracking for Romney in 2007, 2008,” recalls Pounder. “That was tracker footage,” says Pounder. Inside Miller’s office, where he and Pounder are talking through the plans for 2014—they expect a budget of $10 million to $15 million, according to the Huffington Post—there’s a bookshelf with a copy of What A Party!, the chest-thumping, golf-game-reminiscing memoir by now-Virginia Gov. Terry McAuliffe. It’s a memento of their first real loss. America Rising came up with one of the most theoretically damaging hits on McAuliffe, a promotional video for his troubled car company, GreenTech. The man who’d repeatedly talked about bringing a car company from China to America stood in Outer Mongolia, grinning about the 15 million square foot facility going up there. Neither Republican campaigns nor reporters had noticed it. America Rising found it buried on the GreenTech site. Other hits followed, all on this theme, but McAuliffe won anyway. “The campaign kept him from doing one-on-one interviews,” says Pounder. “Very few press gaggles after his events,” adds Pounder. America Rising is counting on candidates being questioned in states that have been voting Republican for president or where the local Democratic party has been losing elections: Alaska, Arkansas, Louisiana, Montana, North Carolina. Republicans need to win six Senate seats to take total control of Congress, and they realize they could have done this earlier if they hadn’t nominated losers in a few 2010 and 2012 races, or if millions of dollars hadn’t been blown on stupid ads. All their tracking can serve as a foundation for the 2014 contests. Why would support for a public option hurt a candidate? “It fits in because you ask: You thought Obamacare’s implementation was bad? They wanted to go even further.” America Rising is the freezer of the Republican party, storing messages and narratives are, that can be taken out at the right moment, microwaved, and served to voters.